For the heavier users among us Tre brewed this firm version. Quoting him: ‘Whether it be bourbon or pomade made in the commonwealth of Kentucky, you can count on the man that did the brewing to have a secret stash or “private reserve” hidden away in a back room for only the most special of occasions. The way we see it, if you’re still breathing, it is a special occasion. For that reason alone, We’re making Red house private reserve available to you! Tre decided to brew a cocktail of his medium and his firm and The red house special blend was the result. The special blend stands for a good balance between easy style-ability and a solid medium-firm strength. Oil based medium and firm. Tre already offered oil based pomades in the past but these were closed down. The private reserve pomade comes in a 4 oz glass amber jar with pretty labels + a gold cap. The gold matches the whole perfectly! 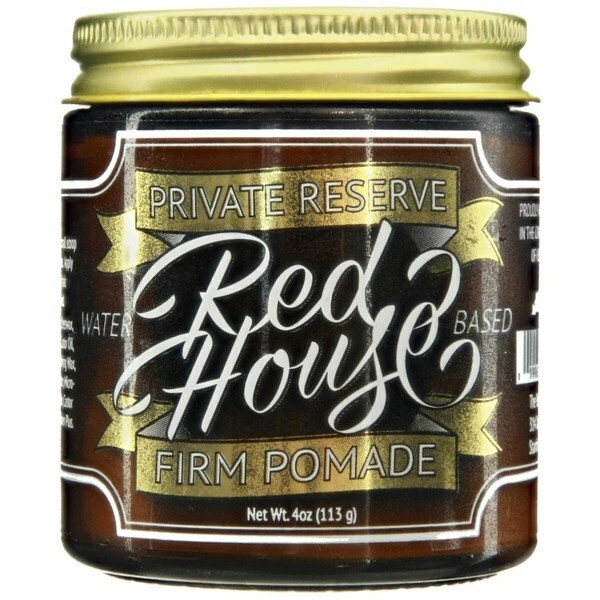 On top of the cap: the Red house logo = handy, no hassle to find the pomade in your collection. It has an off-white color. Water, Beeswax, Avocado Oil, PEG-40 Castor Oil, Carnauba Wax, Vegetable Based Emulsifying Wax, Fragrance, Mango Butter, Microcrystalline Wax, Lanolin, Castor Oil, Stearic Acid, Optiphen Plus. Wax is well represented in the formula. We’ll talk about that later. PEG-40 castor oil: hardened castor oil with 40 polyethylene glycol units. Derived of hydrogenated castor oil (castor wax). Used as an emulsifier, surfactant and fragrance ingredient. Surfactant: reduces surface tension between two immiscible liquids. Carnauba wax: hard wax and not the easiest wax to work with. Therefore, not commonly used. Vegetable emulsifying wax (e-wax): emulsifier, binds/mixes water, oils, waxes and butters together. Stearic acid: represents a significant component of the skin and sebum of the intercellular substance of the human stratum corneum. Used as a co-emulsifier (mixes water, oils, waxes and butters together) and gel former. Optiphen plus: preservative because of the pomade’s water content. Without a preservative: unhealthy molds, yeasts, bacteria. Tobacco-vanilla. Don’t get the idea of a cigar/cigarette smell due to the tobacco. Tobacco comes from the leaves of the tobacco plant. Rockriver pomade offers an oaked vanilla-tobacco scent but that one is totally different. Now back to RH. Scent in the jar: rather strong but overwhelming: no. In the hair: subtle sweet notes of vanilla and cinnamon. The cinnamon is most present in my opinion. Really dig this aroma, normally I avoid cinnamon odors but this one is so good. You can best compare it to the smell of a bakery. It lingers all day, in an agreeable, not overpowering or pushy way. It’s best to style with clean and dry hands before digging in the jar. Remove residues, possible dirt and hairs to avoid molds, yeasts and/or bacteria becoming the pomade’s residents. Store it in a cool and dry environment. Application to damp hair for me as usual (natural wave tamer) and also facilitates the styling process with a pomade on the firm side of the spectrum. It works both on dry or damp hair. What about the scoop-ability? Hard top layer, a solid finger push ladles it out of the jar. Breakdown: need some force and several intense hand rubs. Ribbons, has a thick, waxy texture, dry and pasty. It did not permit me to break it down totally (using smaller amounts helps), first you get big clumps of wax, these can be mixed towards a waxy white paste, no beads of wax left. I worked it through my hair that way. There was some white streaking going on but that disappeared after combing through. Noticed some resistance putting this pomade in but not painful by any means. Spreading evenly went rather easy. Combing the mane back and changing the hair’s direction to part: tension styling with a Denman brush, situation you can expect with a firm pomade. 3 average licks in the mop. Its firm control allowed me to style easy and quick. Did not experience difficulties due to the firm waxiness. The stickiness helps to keep the hair together very well. No problems to tame waves and cowlicks! Sides held in place. Alright slickness: no flyaways/strays popping up which is great for it has a drier consistency. Obtained some great height and decent volume. Experienced sort of grippy, stiff sensation at first but that went away. Medium in terms of weight. Hair shape: great, slick, neat, clean! Looking back after half an hour: no sag, no splits, no flyaways, cowlicks held in place, no wavy mane = just tight hair! PR’s waxy texture gives it oil based properties. Medium (5/10) according to RH. A few notches above neutral in my hair. Looks clean and neat. Shine is nice in the sunlight. Shine persisted the rest of the day. Firm (7/10) RH says. More of a heavy in my hair. It’s heavier than f.e. Black ship and as firm as Firsthand supply pomade. Rex wax water based has more of a hold. Great hold with great endurance under all kinds of circumstances: withstands light walks and a medium-strenuous bicycle trip, sun, little wind. Temperatures were around 60 ° F. In short: an ideal hot summer pomade! Not needed. Restyle test: a tad of resistance while combing. Keeps its great hold: no waves showing up, no strays or saggy hair. Clean, waxy and workable. Its waxy texture did not make it difficult to style next day. It is waxy but not overly. Using brushes helps too. I styled on damp, not washed out hair. Make sure it’s not too wet as the pomade will glide over. On day 3, I took 2 scoops on top of unwashed hair and got the impression that weighed down my hair somewhat. 1 lick was probably enough. For the waxy build up, it was a bit more difficult to style. Washing with little shampoo and hair tonic will help to manage this. RH claims it all washes out with one shampoo. Let me say, it takes 1-2 shampoos depending on your shampoo, how much shampoo, the amount of pomade build up in and your hair type. Washes out easy, great to use for just 1 day if you wish. Soft hair with a healthy sensation after rinsing out. There are no real similar ones. Firsthand supply co, heavy hold water based. Flagship pomade co, Black ship (a tad less of a heavy hold water based).